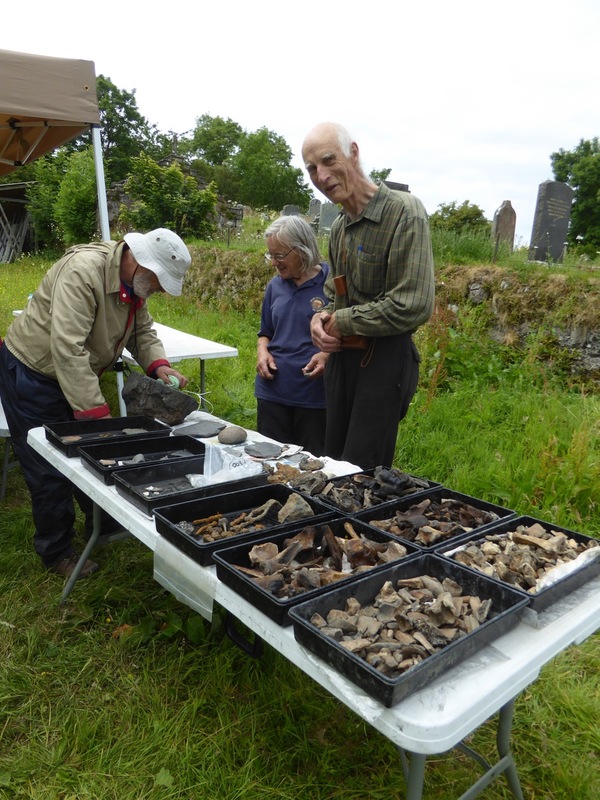 In 2016 and 2017, the Community Dig aimed at revealing what was left of the cathedral nave and assessing the condition of the remaining masonry. We knew what was there in advance. 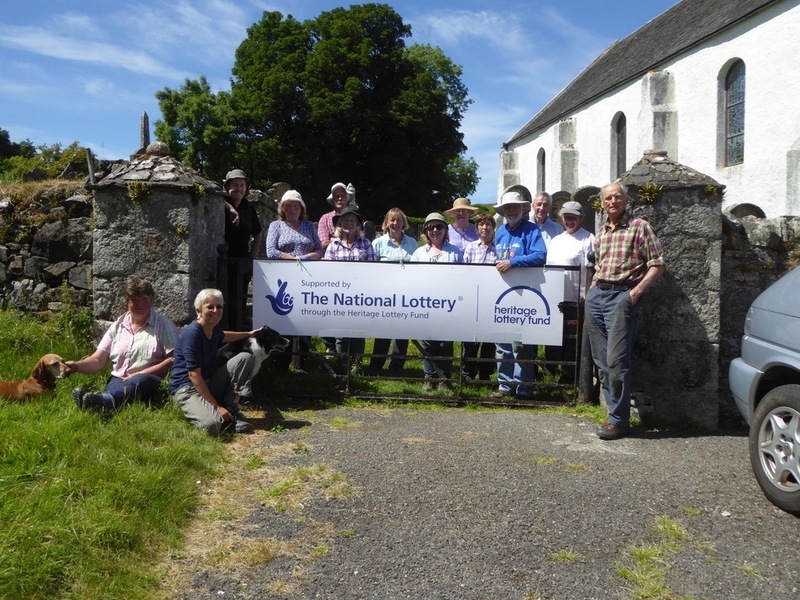 The aims of the Dig in 2018, again under the supervision of Clare Ellis, Argyll Archaeology, were quite different: to try to find the boundary of the Celtic Church lands round the church, and to understand the area to the east of the church: looking for the boundary wall of the old graveyard; tracing the road shown on 18thC maps round the graveyard; and making a start on the search for other structures round the cathedral. There was a real possibility that we would end up finding very little over the two weeks. Could this be a memory of the monastic boundary? revealed nothing but ridges of bedrock and undisturbed soil up to the wall, where there was a small area of man–made cobbling, well below the foundations of the wall. Strangely, the cobbling did not reappear on the other side of the wall. Another trench was opened a few metres to the north to try to understand the meaning of this cobbling (foundation of an old wall, pathway?). 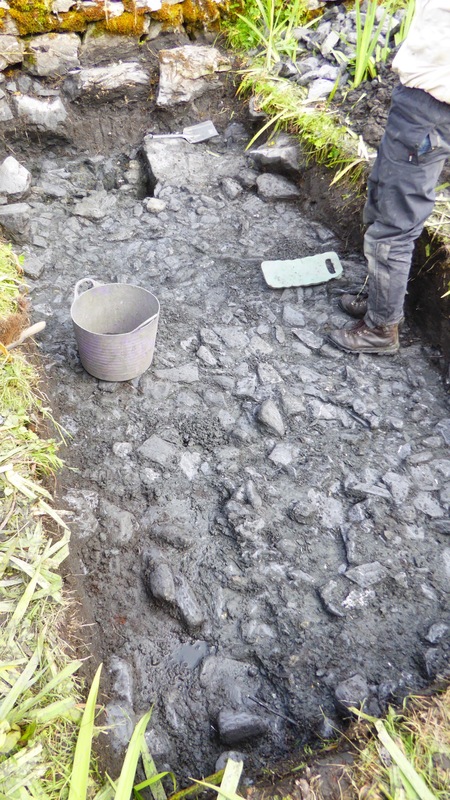 This revealed a 2m wide cobbled area under stone-free soil (above left), but a further trench to the north showed only undisturbed soil. 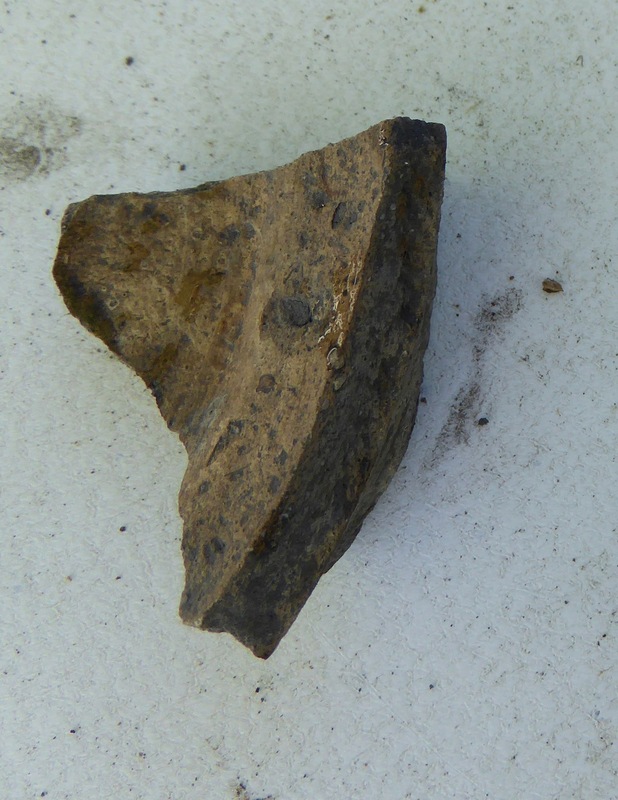 important finds from the east trenches were large quantities of slag, showing that the area had been an active site for iron smelting (at any time from prehistoric times to 18thC). 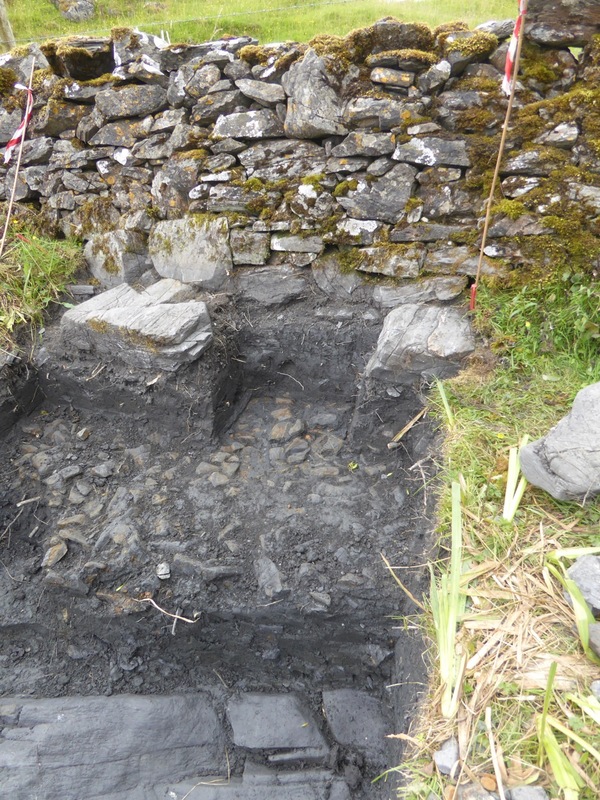 In the coming months, these findings will be interpreted by comparing with other Celtic Church sites. 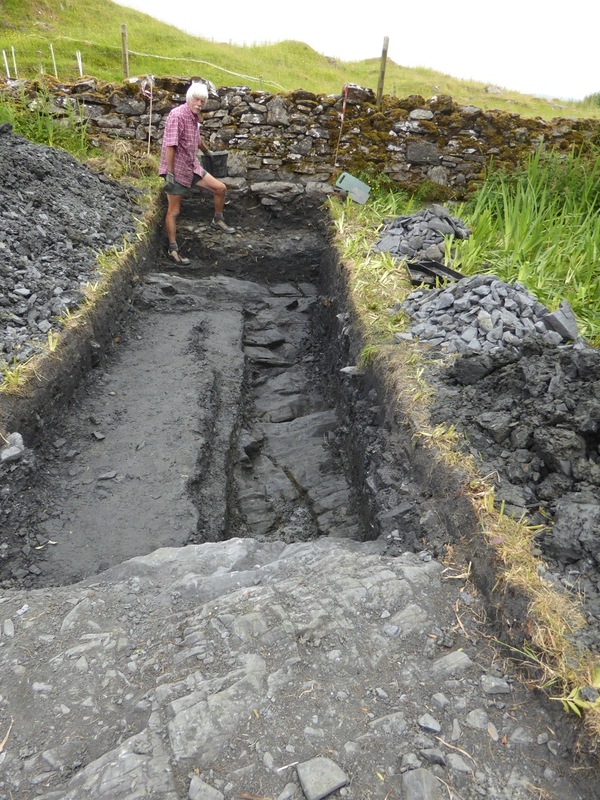 It is likely that the difficult geology of Lismore made it difficult to create a conventional ditch. 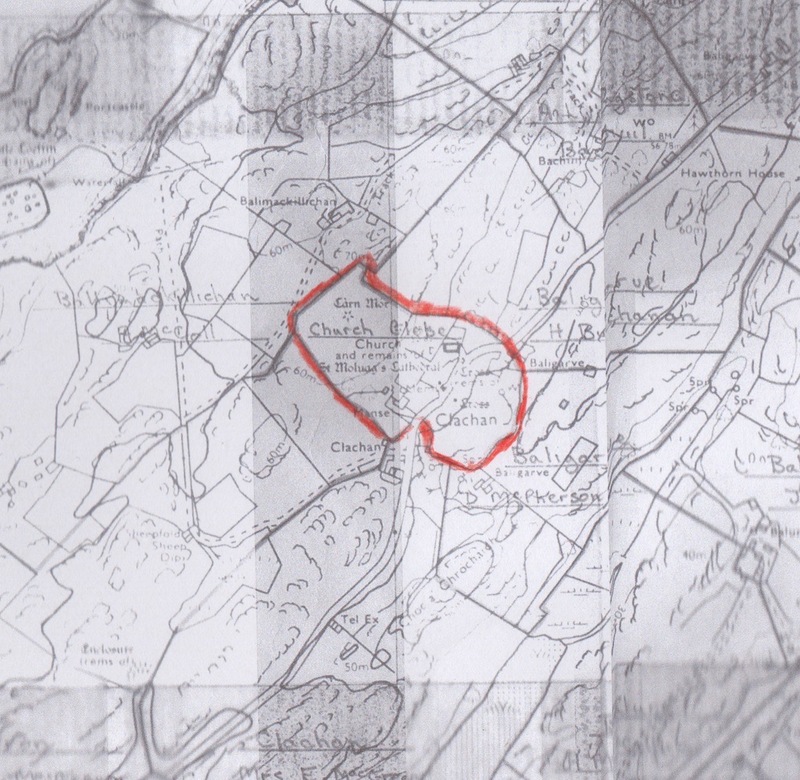 Two 16m trenches were excavated to the east of the modern road. 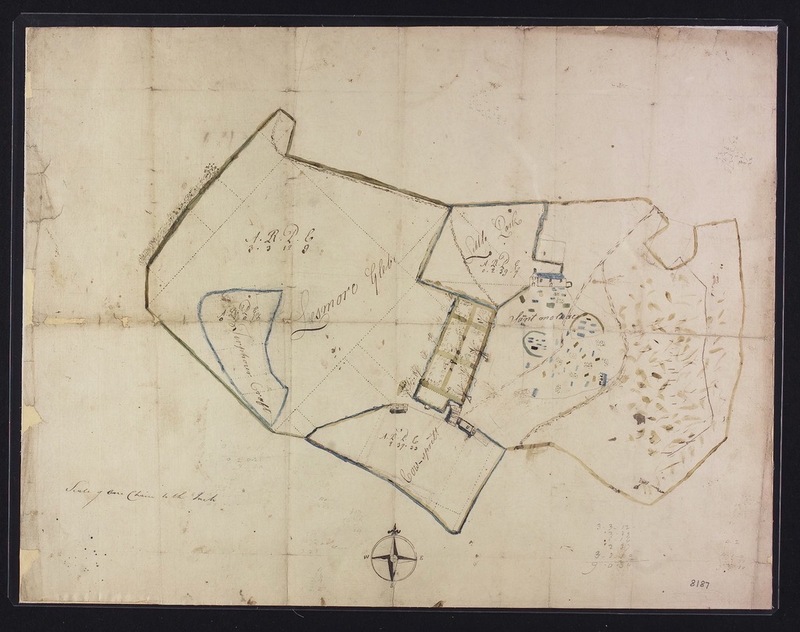 These confirmed that this area has been used as a dumping ground for centuries; in the case of the trench below the new manse, it took a week of careful digging to remove the spoil dumped on the area during the building of the manse in the 1970s. 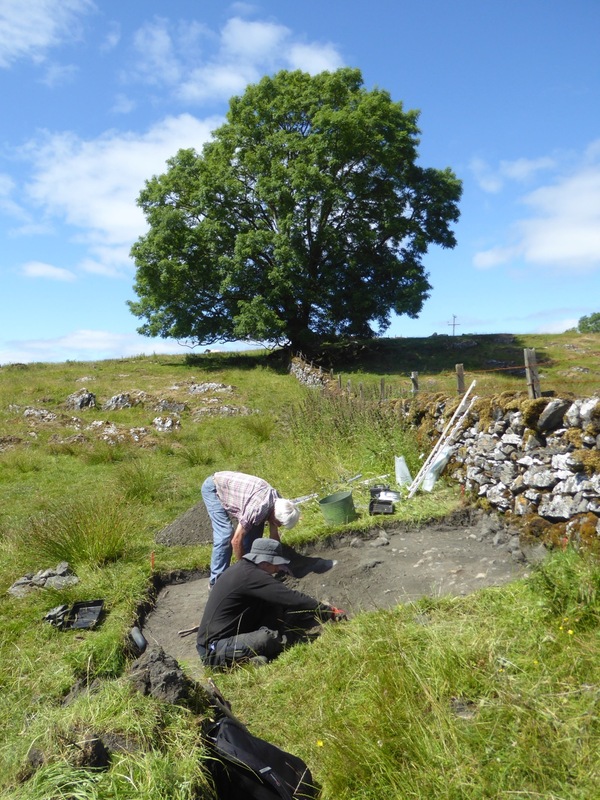 This reduced the amount of archaeological work that could be achieved onthe site within the available time. The Second Trench encountered the modern building debris. This included large quantities of broken bone from burials in the manse area. These were carefully collected and will be reburied in due course. 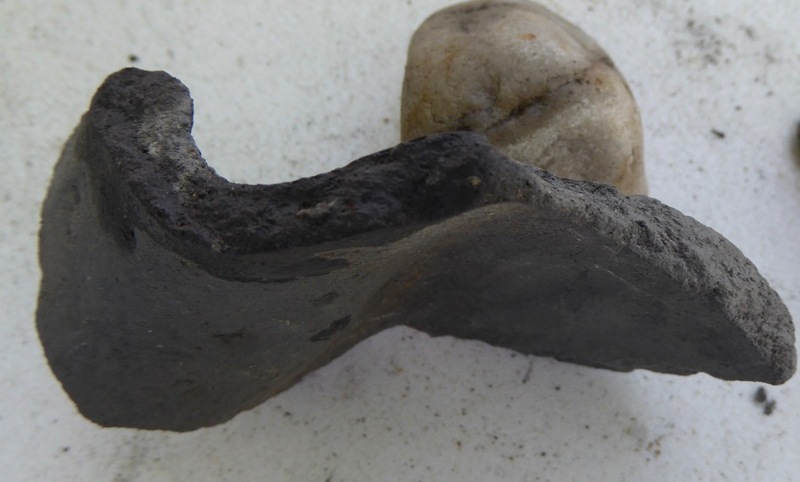 The team also recovered various pieces of iron, including nails. Further down, in situ burials were encountered, which showed signs that successive burials had been cut through earlier ones. 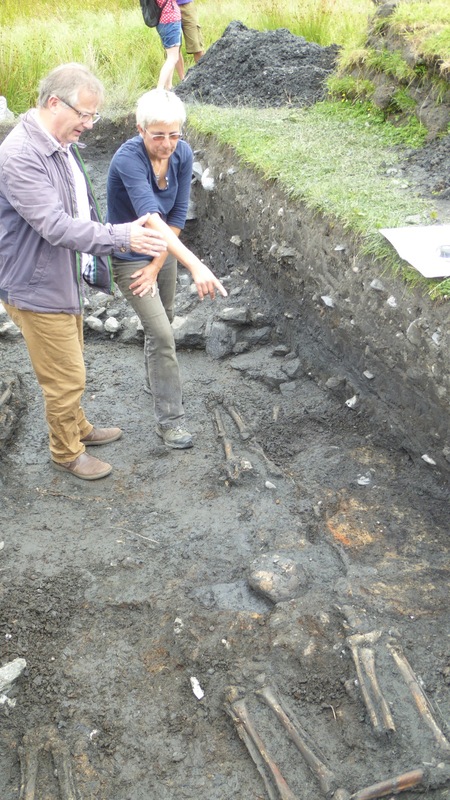 Shortage of time ruled out any further investigation of these burials, although it is likely that they are late medieval, lying above any that might have been associated with the Celtic Church. They were left undisturbed. 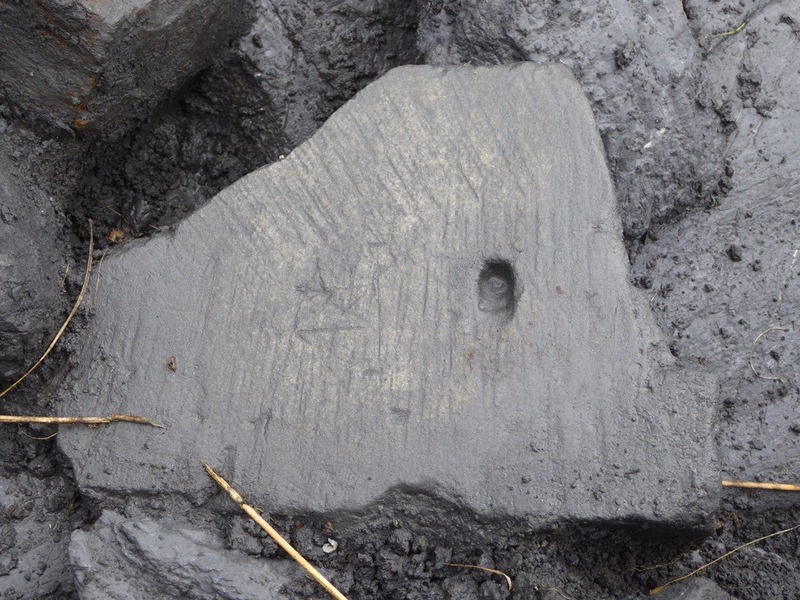 The most intriguing finding was that a hearth had been cut into the burials. 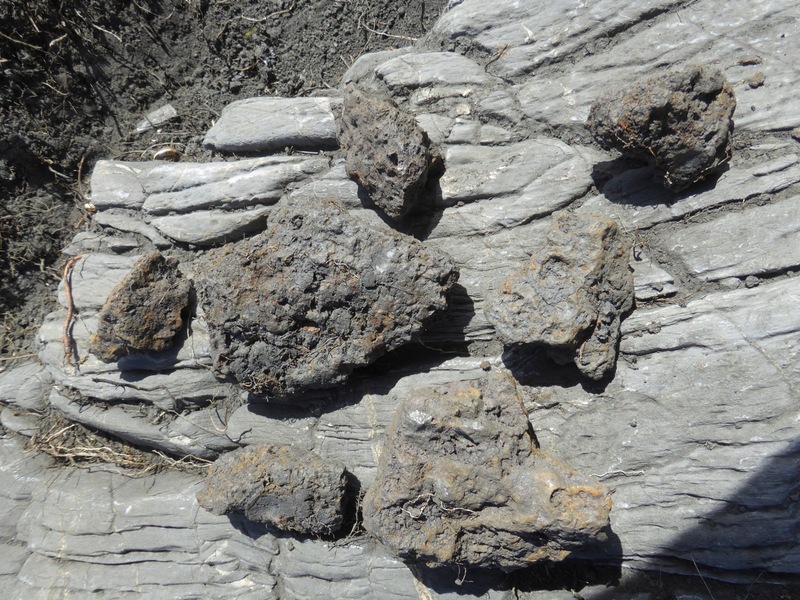 A sample of charcoal was recovered for dating. All of these findings will now be assessed over the coming months, in preparation for future work.